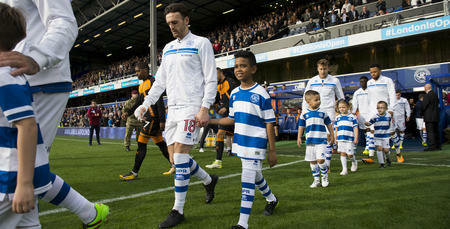 QPR in the Community Trust were delighted to welcome Ahmed Elghali of Wood End Academy to Loftus Road for the recent visit of Wolves. Ahmed was invited as the winner of our Premier League Writing Stars competition, part of QPR's Premier League Primary Stars programme, delivered within our local schools. Ahmed competed against over 20 other students to write a poem based on resilience. The winning poet would lead the QPR first team on to the pitch against Wolves, have their poem recorded for the big screen at half time and printed in the following game's programme against Sheffield United. Ahmed’s journey to leading the team on to the pitch began two weeks prior to the match when he began writing his poem during our Premier League Writing Stars workshop. After finding out he had won the competition the excitement was clear to see as he slid on his knees across the library carpet. Ahmed’s day did not end there. He, along with his parents, watched an exciting first half before being brought out on the pitch at half time. 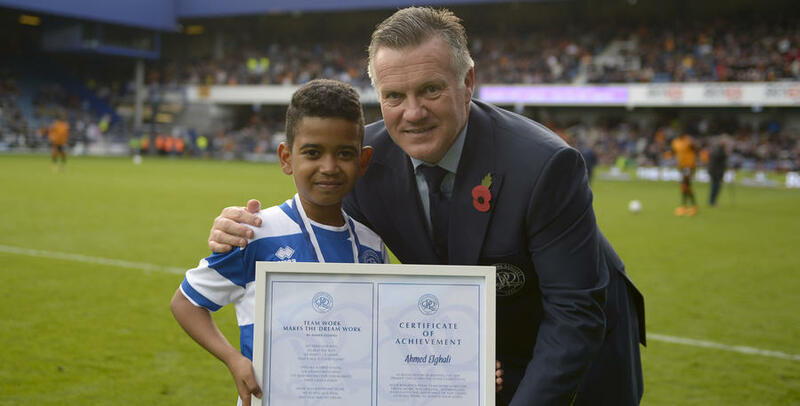 After seeing Steve Wicks and Clarke Carlisle inducted into The Forever R’s club, Ahmed was presented with a certificate and his poem by club ambassador Andy Sinton. Following this, Ahmed joined the crowd in watching his poem Team Work Makes The Dream Work on the big screen. Ahmed’s mother explained how Ahmed reached his goal of winning the competition, adding: "I couldn’t believe it; he was so determined to win this competition. He sat down and thought so hard about the values of the poem and wanted to write something that nobody else would have. Ahmed said that he wanted it to be about a team losing but they kept trying and trying until eventually they managed to get back in to the game, which they finally did! Ahmed’s poem will now be entered into the national Premier League Writing Stars competition, with a chance to win more prizes for both himself and his school. Congratulations and good luck Ahmed! For your chance to take part in future Premier League events, a range of teaching-support materials and competitions, sign your school up for free at www.plprimarystars.com. To find out how the QPR Primary Stars team can enhance both your pupils’ and teachers’ experiences of school, please contact Tom Charles, Primary Stars Coordinator, by emailing [email protected]. That’s not a good sound. We hope this will inspire Ahmed to continue to write poetry and work on his literacy skills!